Ubiquitous positioning is intended for providing smooth and seamless positioning solution across indoor and outdoor environments, and it is usually achieved through a hybrid positioning scheme that integrates multiple positioning technologies. 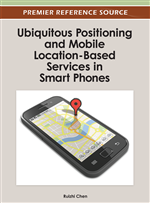 This chapter explores various aspects of hybrid positioning with smartphones. First, it presents a hybrid positioning solution based on hidden Markov models (HMM). The hybrid positioning solution utilizes multiple location sensors and signals of opportunity that are available in smartphones, and integrates multiple relative and absolute positioning technologies to achieve ubiquitous positioning. The hybrid positioning solution provides a significant improvement over individual positioning technologies in positioning availability, accuracy, and reliability. Then, this chapter generalizes the concept and the methodology of hybrid positioning. Different relative and absolute positioning technologies are comprehensively reviewed based on their respective operation principles. These positioning technologies have the potential to be integrated in a specific hybrid positioning scheme. This chapter is concluded with some considerations for designing a deliberate hybrid positioning solution followed by a short summary of the whole chapter. Increasing mobility of people and devices requires the support of various location-based services (LBS). For ubiquitous accessibility of these services, LBS necessitate seamless positioning across indoor and outdoor environments. As smartphones are becoming a standard mobile platform for various LBS, seamless positioning with a smartphone significantly enhances the convenience of users’ daily life and user experience. A seamless positioning solution can be obtained by integrating multiple location sensors and signals of opportunity. A positioning system is called a hybrid positioning system if it utilizes two or more positioning technologies. Thanks to increasing built-in resources of smartphones, it is feasible to perform hybrid positioning with smartphones although these resources are not originally intended for positioning functionality. Firstly, more and more sensors are equipped in smartphones to support value-added applications, and many of them can also be used for positioning as shown in Table 1 (Apple Inc., 2010; Nokia, 2010; Samsung Electronics, 2011). In addition, the computation capability of smartphones, including processing power and memory size, is now adequate to support hybrid positioning.